Villa Zanzibar is a charming, private house for rent located on a jungle-clad hillside, steps above La Ropa Beach. Enjoy the views of La Ropa Beach, Zihuatanejo Bay and the twinkling lights of the village at night. An enormous cathedral roof thatched with palapa palm leaves, over hand-hewn beams tops Villa Zanzibar. The peak of the roof rises 26 feet above the stone and tile floor and catches cooling breezes from the bay. The hand-smoothed adobe interior, finished in earth tones, imparts a wonderfully serene atmosphere, which, with the background susurration of the Pacific Ocean waves on the rocks below, lulls one to sleep at night. 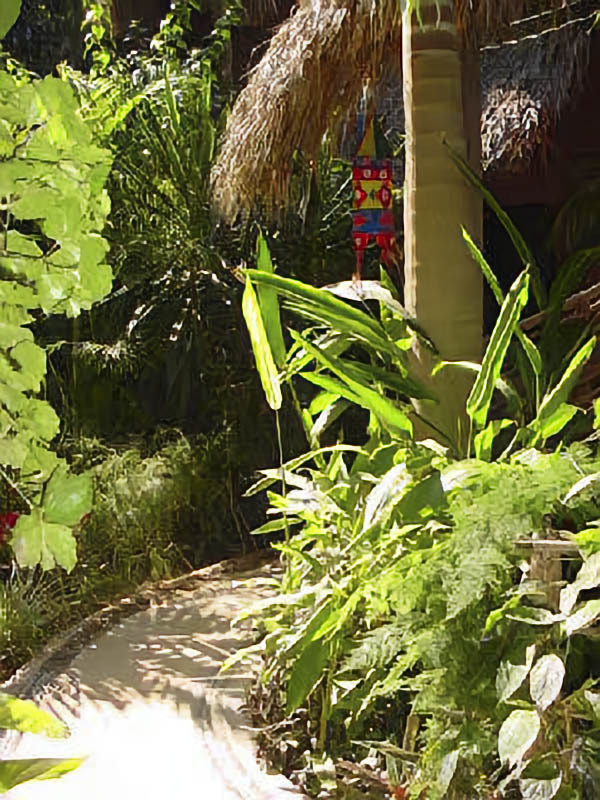 Villa Zanzibar is surrounded by tropical gardens with vine-covered walls, ensuring privacy and security. The house has 2 air-conditioned bedrooms downstairs, each with king-size beds that share a large bathroom with a beautiful pebble-floored snail shaped shower and separate W/C. Up the rustic staircase is a large open loft with a sitting/lounge area, king-size bed and separate bathroom with shower. The kitchen, dining and living area overlook breathtaking vistas of Zihuatanejo Bay. The house faces west and the sunsets are magnificent. Please inquire via e-mail for rates. A 40% deposit is required to hold a reservation. The balance is due on arrival. haven’t been here for 18 years don’t know why we waited so long. Lois, David and Natie – Thank you very much For Providing this experience!!!!! Georgia, Rich, Linda, Robert, Stacy, Megan, Joe, Missy. Villa Zanzibar was just what the doctor ordered. New Years Eve Fire works were beautiful over the bay from VZ. Susan + Grace – San Francisco C.A. Had a Wonderful time, hate to leave. Salsa and Guacamole will never taste the same after Natie’s. David and Lois were very helpful. Thanks for the tour of the city David. It was very informative. Lois, Thanks for all you did to make our stay enjoyable. We hope to be back soon. Thank you, Gracias Lois, David, Beej, Nick for a fabulosa holiday. None of us are ready to move back to our real world, we like yours. Zanzibar Villa creates an atmosphere of complete relaxation and we capitalized on it. The Villa Is charming in many ways and the view is inspiring. Natie was a wonderful hostess! Again… We can’t thank you enough for opening your home and hearts to us! Villa Zanzibar and our entire three weeks here was beyond our wildest dreams. You made it so Special. We’re sad to leave same time same place next year. Lois and David Thanks so much for the use of Villa Zanzibar we had a great time. Enjoyed Watching the local squirrels in the nearby trees as well as the assortment of birds. It was a great vacation, Thanks again. We had such a great two weeks in Zihua and the last week at Zanzibar was the high life. We Spent a lot of time here soaking up the view, sound of the waves and the atmosphere of the villa. I was so impressed by the architecture and attention to detail, BRAVO! “Shangri-la” at the Zanzibar is at the very top of the most memorable moments that were showered upon us on this, our 50th wedding anniversary. Thank you for the gift. Thank you for the privilege of staying at this tremendous house. The thoughtful touches of fresh flowers, salsa and guacamole were appreciated. The decor is wonderful, creative and comfortable. Thanks again. We will look forward to staying here again in the future. A surprising jewel on the hillside of Playa La Ropa! What a wonderful experience and change from tropical hotel travel. A tropical hideaway for a week of good food, fun and great friends. Early morning walks/jogs along the beach to start the day and cocktails at sunset. Thanks for the memories. Pam and Al Brower - Gig Harbor, Wa. At the end of a perfect 2 weeks, we have nothing but praise for Villa Zanzibar. As long time visitors to Zihua, staying in this marvelous house away from home has given a whole new perspective on this wonderful spot. Although the town is changing fairly rapidly, Playa La Ropa stays the same - Villa Zanzibar provides a fine retreat in the middle of endless days of doing nothing. Best of all, however has been sitting here with binoculars at hand watching the birds, butterflies, squirrels, dogs and cats and all the activities in the bay and on the beach. Just wanted to drop a note to tell you we loved our stay in Zihua. The people were friendly, the weather great, and Villa Zanzibar worked out great! Hope to see you again. Let me know what next year at the same time will look like. Take care and thanks. It was such a pleasure meeting you both and spending a week in your beautiful villa! It was an experience we will never forget. We can't thank you enough for sharing a part of your wonderful lifestyle with us. We also want to thank your staff for taking such good care of us! They are all gems! Thanks again for everything! We had a great time. We've been to Zihuatanejo before, but never to Villa Zanzibar - thanks for everything! Renting a house is the way to go! We came from Chicago and L.A. This trip was definitely worth it. Villa Zanzibar is a perfect spot, to enjoy the sea and a spectacular view day and night. Despite the heat, we were comfortable with fans and natural breezes. See you next trip - Thanks for your good design on building Villa Zanzibar. What a wonderful tree house with such a fabulous view, amenities and of course, Natie! We are probably the only people who have used the villa for a working week. However, the location and space was perfect for our meetings and planning we look forward to our return and to been your new neighbors. Susan, Joanne, Barb, Glen & Daniel. Muchas Gracias para la vacacion fabuloso! Natie – thanks for taking such good care of us – We know you are terrific. Thanks for the beautiful picturesque villa it is a wonderful place to call “home” for a week. Christmas in the tropics is a lot of Fun! – Different from a lot of snow we left behind. The Christmas cookies were fabulous Lois. Lois and David Shawn and I both really enjoyed the visit here in your beautiful “tree house” The view was incredible and seen all the different animals, including a large iguana in the trees around us was a treat. Thank you for all the wonderful memories here in beautiful Zihuatanejo. We will definitely be back with more friends. Now all I can say is I wish we another week. It Will be hard going back to reality. We all had a great time your children are wonderful. Of course Zihua is beautiful, Zanzibar is a beautiful place to stay hopefully we can come back soon. We all had a truly wonderful vacation at Villa Zanzibar – beautiful and comfortable! We will definitely be back – and thank you for taking the time to introduce us to Zihua. To bad Gilligan didn’t find this island. If Anybody finds faults with this place nothing will make them happy. What a place to be marooned we love Natie’s treats. Quotes by 4 Wallace’s & 2 Sims. Spent 4 wonderful nights. The Full moon setting over the bay at pre-dawn is worth getting up for. Natie was very helpful, pleasant and un-intrusive. Also Stayed at a five star hotel and thought here was much more private and with more character. Thanks Lois and David For providing such a comfortable relaxing place to stay. A beautiful setting for a great week with our great friends from Gig Harbor and Boston. Cards, chess, sailing, jet ski's - great food prepared here and in the restaurants. Thanks for the good sound system as well. We will cherish our time here as one of our best vacations (and we have traveled the world)! Thanks again - John and Barbara Wa. We are taking many memorable thoughts and feelings from our brief stay at Villa Zanzibar. Having our initial interest stirred by your internet site, I did not think the ambiance of Villa Zanzibar was expressed in your advertisement. The vine wrapped columns, tree -trunk-supported staircase, alligator floor murals, built-in fixture create and architecture jewel. More important than the physical comfort and beauty of "slice of paradise" was the personal interest both of you gave to us. Thank you for meeting us at the airport, giving us a guided tour through central Zihuatanejo and making sure all our needs were met. Nati's thorough attention to the villa Cleanliness added "the sweet icing to a delicious cake". What a wonderful fantasy - spend a week in beautiful Mexico in our outdoor house nestled in the treetops with a view of the beach, crystal blue water and the cliffs. Thank you for making this fantasy come true! Your casa is fantastic! Our 28 hour travel from Australia was immediately forgotten once we stepped into your little piece of paradise - Villa Zanzibar. We loved the limonada, fruit salads and salsas from wonderful Natie (would like to take her home). Our very favorite thing to do was relaxing at Villa Zanzibar soaking up the views with a cerveza. We had an awesome vacation. Just what we needed to relax. Lois and David, thank you so much. We had a great vacation!!!!!!!!!!!!! Villa Zanzibar provided a great little paradise "get away".